Posted By:Unknown | At:7:13 AM Be the first to comment! Rep. Barbara Lee (D-CA) on Wednesday slammed Fox News host Bill O'Reilly's "race hustlers" remark as "disgusting and divisive." O'Reilly labeled Lee a 'race hustler' after she claimed remarks made by Republican congressman Paul Ryan about the inner cities were "thinly veiled racial attack." "These race hustlers make a big living and they get voted into office by portraying their constituents as victims," he said. "And it's all your fault, and it's my fault, it's the rich people's fault, it's the Republicans' fault. It's everybody's fault except what's going on." Washington, D.C.— Today, Congresswoman Barbara Lee released the following statement responding to recent remarks made by FOX News’ Bill O’Reilly. A full clip of these comments can be found here. “Unfortunately we’ve come to expect language like “welfare queens,” “food stamp president,” and now “race hustlers” from the right wing and Mr. O’Reilly. It is disgusting and divisive and should never be accepted in our national discourse. “For us to achieve the American dream for all, we must engage in this conversation that has been sparked about race and poverty, even if it is difficult for some. Racial discrimination, poverty, and income inequality remain issues that must be debated and addressed, and these kinds of ‘code words’ only get in the way of solving the real problems. 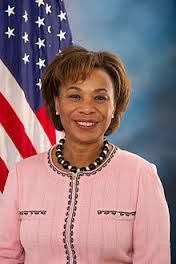 Follow Barbara Lee on Facebook and Twitter at @RepBarbaraLee. To learn more, visit lee.house.gov. Congresswoman Lee is a member of the Appropriations and Budget Committees, the Steering and Policy Committee, is a Senior Democratic Whip, former chair of both the Congressional Black Caucus and Progressive Caucus. She serves as chair of the newly formed Whip’s Task Force on Poverty and Opportunity.